Mix all dry ingredients together for the cake so they are all mixed well with each other. Follow them with the oil, bourbon, vanilla, pumpkin puree, and soy milk. Mix well to ensure all lumps are out of brown sugar. Grease a bundt cake pan well with canola oil or nonstick spray, whichever you choose. Fill up 2/3 of the way full and bake at 350 for 30-35 minutes, or until a knife comes out clean. (I think it actually took mine closer to 40 minutes, FYI). Let it cool 30 minutes and mix up your glaze ingredients in separate cup or small bowl. Drizzle over the top and garnish with sliced almonds if you choose. 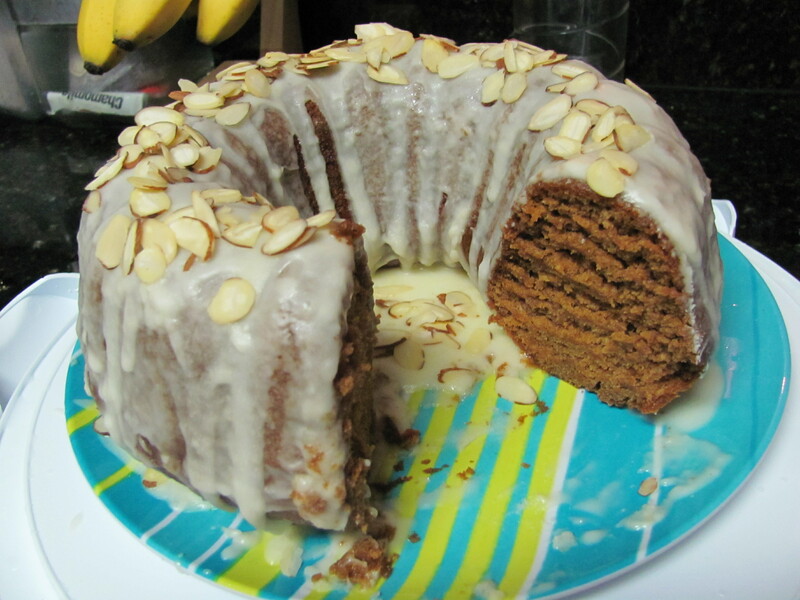 Spiced Pumpkin Bourbon Cake deliciousness!